Between January and June 2018 we were based in the 2 acre walled garden of Drumalis retreat & conference centre. In that short space of time we achieved a great deal of exciting things. Over 100 volunteers attended one of our monthly community volunteer days. Almost 100 primary school age children attended one of our curriculum-based nature education learning sessions. Twenty-four families each purchased a subscription to our pig club and received a quarter pig’s worth of free range pork in return. 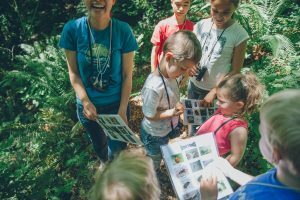 And at our Bioblitz Festival of Science and Nature in June, we welcomed more than 400 members of the public to participate in a 24 hour programme of walks, talks and activities, with traditional music and a free range hog roast thrown in for good measure. We’re raising £300,000 to purchase a small farm outside Larne, where we can bring our ambitious plans for Jubilee Farm to fruition, with pigs, poultry, goats and vegetables, plus an internship programme, and even glamping in due course. Already, we’ve raised £165,000 from existing supporters to purchase the farmhouse. Now, we need to raise £135,000 to buy the 13.5 acres of land, as well as polytunnels and other equipment, by Christmas. As a Community Benefit Society – a form of cooperative social enterprise – we’re raising this money via a community share offer, making this the first community-owned farm in Northern Ireland. Come to our monthly community volunteer day on the 4th Saturday of each month, 2 – 4 pm (restarting after the summer break on 29th September). Book a tour for your group (min. 5 people) and learn about the history and natural history of our wonderful farm. Wellbeing workshops for large and small groups (min. 3 people). Learn and be inspired by our range of formal, informal and just plain fun activities for individuals, schools, churches and groups. Spring, summer, autumn, winter: we’ve got a special event for all seasons. We also organise quarterly members meetings. We produce fantastic free range native beed pork, via subscriptions to our pig club. Agroecological vegetables and eggs coming soon.